With Christmas break behind us, we embraced the wonderful world of winter! We chose Owl Moon by Jan Yolen to be the first row of the new year. The first week after Christmas break is bittersweet, but I had a few tricks up my sleeve to ensure everyone transitioned smoothly! I set out a really fun winter sensory bin accompanied by Walking in a Winter Wonderland , a beautifully illustrated picture book from the kid’s aunt! I read aloud while the kids worked together to set up their winter wonderland. After setting the scene, they enjoyed some imaginative play. I LOVE that our kids aren’t afraid to launch deeply into the land of make-believe as they tell stories and act out characters together. Honestly, it reminds me of Wendy, John, and Michael in Peter Pan . As with all our other books, the boys created cover pages based on the illustrations from our book. This is a great way for them to pay attention to details and draw things that they otherwise wouldn’t think about. I chose to have the kids memorize Joshua 1:9 for this row. I created a Bible Verse Pack for this book. You can purchase it here in our TPT Store. There’s a bonus FREEbie in the Preview! Jordan traced the Bible verse one day and another day we cut it apart and he glued it in his lapbook like a puzzle. He continued to work on memorizing the verse using the Bible verse puzzle. We talked about fear and being brave. We also discussed that it’s important to talk about our feelings, but we should focus on Christ not our fears. We read I’m Not Scared! 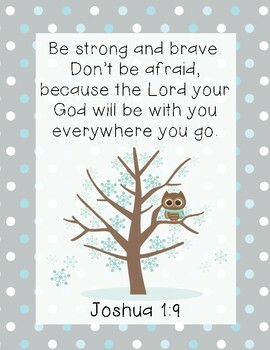 , Brave Enough for Two: A Hoot & Olive Story , and The Berenstain Bears, Do Not Fear, God Is Near . The Berenstain Bears are still a family favorite and this book was all about shadows too! It was a perfect pair with this row! God’s word is a light to our path and his perfect love casts out all fear. A luminary craft seemed like the perfect activity to follow our discussion on fear and bravery. The kids painted their glass jars with Elmer’s glue. Then they covered the glue with colored tissue paper squares. We kept a winter palette of blues, white, and purples. We made sure all the tissue squares were moistened with glue then we set the jars aside to dry. Once dry, we added a glitter LED candle inside. They looked beautiful! We learned that this story was based on Jane Yolen’s husband and daughter. It was the little girl’s first time going owling with her father. We talked about the relationship between the father and his daughter. We read When Dad Showed Me the Universe , a story about a father wanting to share a special moment with his child. We talked about first time experiences and read Running with the Horses , an exciting fictional story about a young girl and her father who live at a riding school famous for their Lippizaners. With a dramatic turn-of-events, the girl is able to help rescue her favorite horse. This book was set in a wooded area on a farm. Our sensory bin was the perfect medium for exploring a woodland setting with cottages, trees, and forrest creatures. In addition to talking about the setting of the story and playing in the sensory bin, I printed a story setting page from LittleRed’s Owl Moon Worksheet Packet . The boys wrote about and sketched the woodland story setting. We read Owl Babies and I set out the supplies for an owl construction paper craft. First, the boys glued the brown paper branch to the blue construction paper. Then they added the green leaves to the tree branch. They glued the white owl silhouette and painted it with a pom-pom dipped in a mixture of white, yellow, gold, and brown tempura paint. We added dots of white glue and the construction paper eyes. Afterwards, Jordan dipped one side of the pom-pom in brown paint and added some details to the owl feathers. We set them aside to dry. Once dry, the boys used black sharpie pens to add more details to the face and claws. Both boys typed their poems and we glued them to the bottom of their Owl Baby craft. They turned our really cute! I brought out The Know-Nonsense Guide to Grammar book. 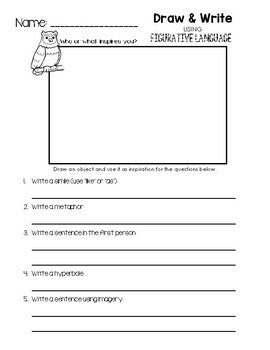 We read about Metaphors and I created a worksheet for the kids to work on. You can download it for FREE here at our TPT Store! I handed the boys some super yummy smelling hand-made soap from a local soap company. They sketched their soap bars and even included shadows. Then they wrote a simile, metaphor, hyperbole, a sentence in the first person, and used imagery. I tried to combine all our language arts lessons into one! When their grammar lesson was over, they jumped up and called my name. They showed off Park’s tee and said “Mommy…a simile!” They were so proud of themselves and RIGHTFULLY SO! Moments where THEY connect the dots make homeschooling SO rewarding. Great job boys! 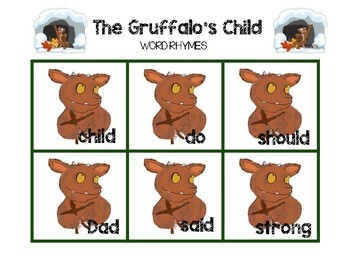 I created a Gruffalo Rhyme pack for the boys to work on matching rhyming words. Their big sister created some of the clipart we used! You can purchase them here at our TPT Store. I taped the track word cards on the window and hid the matching word cards around the room. The hunt was on! Each time they found a card, they went to the window and matched the rhyming pair. Jordan was learning about comparative and superlative adjectives in his Sonlight language arts lessons. 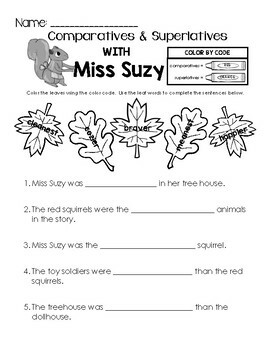 We read Miss Suzy , an adorable book set in the woods. I drew a quick worksheet for Bub to work on. I created a version of this worksheet that you can download for FREE here at our TPT Store! First, Jordan color-coded the adjectives as comparative or superlative. Then he completed the sentence using adjectives from the leaf word bank. 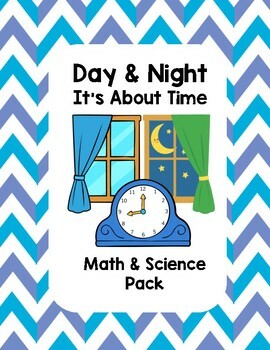 I created It’s About Time, a math and science pack for the boys to work on. First, we read several books about the sun, moon, daylight, night time, and keeping track of time. Afterwards, the boys read and colored their worksheets. Owl Moon takes place in the snow, so we spent some time reading about winter and snowy weather. The Snow Show was a really cool book, in that it taught about the water cycle and how snowflakes are formed through a snowman chef story line. It was REALLY cute! We read several wonderful non-fiction books about snow and the beautiful season of winter. We also read some really fun picture books with sweet stories! I made a batch of chocolate cupcakes and placed a Teddy Graham in each one. I baked them in the oven and they the house with the smell of yummy goodness! We topped them with some “snow” (whipped cream) and the kids gobbled them up. We read Winter’s Coming: A Story of Seasonal Change and Winter Dance which were both great books about animals migrating, hibernating, and adapting during the winter. I made them a batch of snow dough and they spent the late afternoon playing while I read aloud. I love those moments! We read WildTracks! and Crinkleroot’s Book of Animal Tracking by Jim Arnosky. We love the Crinkleroot series. The kids are ALWAYS inspired to sketch after seeing Jim Arnosky’s artwork. Using a set of animal track cards (Welcome to Mommyhood) and our ink stone, the kids painted various animal tracks. We’ve done animal tracks in snow dough, but it was fun to actually paint them this way. I also created a seek & find the matching animal in their lapbooks. They used the cards as referenced and wrote the matching animal name. We read several books about shadows and created some shadow puppets. We waited until it was dark to use our shadow puppets. This is ALWAYS a fun way to experiment with light and shadows! Years ago, Haley and I did a Birch tree tape resist watercolor project we read about in our High Five magazine. I thought it would be fun to do it again with the boys. Everyone took turns using two sizes of blue painters tape to create the birch tree trunks in their forest scenes. Once they marked their trees, they used watercolors to paint the background. Haley decided to paint shadows and a moon using a crayon resist technique. Parker worked on his art project later in the afternoon. Jordan added a red fox to his landscape. We set them aside to dry. Once dry, we peeled the painters tape off and the birch trees magically appeared. Jordan’s had a striking blue-gray appearance that gave the feeling of winter. The paint from his red fox may have run a bit, but it added a pop of color that looked really cool! Haley’s painting was dramatic with spiked branches and dark shadows caste against the blue-gray landscape. Her evening sky was beautiful with shades of blue, turquoise, and purple. We couldn’t row Owl Moon without learning a little more about one of our favorite birds, the owl. Which one? We couldn’t resist studying about a bunch! We read some wonderful books about barn owls, but we really enjoyed Jim Arnosky’s All About Owls. We read From Egg to Owl on our Epic app and added the lifecycle of the owl to our lapbooks. We read several Pebble Plus books about Great Horned Owls, Barn Owls, and Snowy Owls. Their books are absolutely fantastic! I had the boys work on matching their owl pictures with the owl name. We reviewed them afterwards. I then had the boys draw a great horned owl using a cool grid technique I found on education.com. This was a little difficult for Parker, so I worked with him as we sketched each square of the grid. He did a great job! I brought out our owl definition cards (Pinay Homeschooler) and the boys color-coded the various parts of the owl in their lapbooks. I bought owl pellets online, printed a bone chart, and gave an owl pellet booklet (The Crafty Classroom) to complete. The kids had fun digging through the pellets and identifying the bones. Years ago Haley dissected the man-made pellet, but the real pellets were AWESOME! 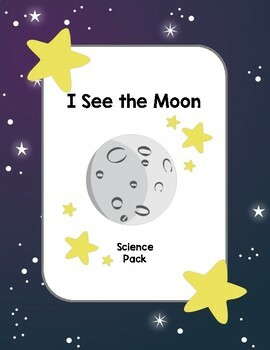 I created an I See the Moon science pack for the boys to work on. You can purchase it here at our TPT Store. There’s a bonus FREEbie in the preview! I printed a copy of the moon phase activity and presented it at the table with a festive Nutella owl pancake and an egg white full moon breakfast. They gobbled it up while I read to them. We read The Moon Seems to Change and a little bit about the moon from our What’s Out There A Book About Space. First, the boys used a non-washable crayon to color in the various phases of the moon. Afterwards, we brought out our watercolor paints and they painted over the crayon which turned out beautifully! Once dry, we added them to their lapbooks. I set out an invitation to create a snowflake craft, which paired nicely with The Story of the Snow Children. This was our first activity after the Christmas break so everyone welcomed a fun art project between studies. I read the story while the kiddos glued and designed their snowflakes. It was fun watching the kids design their spectacular snowflakes. They were simply divine! As with our other rows, we created an Owl Moon playlist with read-alouds, music, science, and other clips. You can find most of the activities, ideas, and printables from this post on our Owl Moon Pinterest Board.